Living in the 15th and 16th centuries, the Italian High Renaissance sculptor, painter, architect, poet, and engineer Michelangelo faced a rather less complicated shopping problem: he had only to send assistants off to market to bring back what he needed. Though vanishingly few of this prolific creator's papers survive today, we do happen to have a few of the grocery lists he sent with them, like that which you see above. John Updike once wrote that “excellence in the great things is built upon excellence in the small," and the observation holds up ideally when we think about Michelangelo's numerous great achievements — Pietà, David, The Last Judgment, St. Peter's Basilica — in comparison to this humble yet striking rundown of ingredients for a meal, of the same basic kind each of us scrawl out regularly. But when Michelangelo scrawled, he scrawled with both a craftsman’s practical precision and an artist’s evocative flair. “Because the servant he was sending to market was illiterate,” writes the Oregonian‘s Steve Duin in a review of a Seattle Art Museum show, “Michelangelo illustrated the shopping lists — a herring, tortelli, two fennel soups, four anchovies and ‘a small quarter of a rough wine’ — with rushed (and all the more exquisite for it) caricatures in pen and ink.” As we can see, the true Renaissance Man didn’t just pursue a variety of interests, but applied his mastery equally to tasks exceptional and mundane. Which, of course, renders the mundane exceptional. Thats alot of fish. I’m sure his breath smelled amazing. What a waste of time to draw pictures of your grocery list items. Thanks. You beat me to the punch! You’re a moron. Didn’t even bother reading the damn article, smh. I live with three artists – husband and our 2 boys. My husband will draw next to my handwritten grocery list. It amuses him. My oldest son will also draw on the grocery list especially when he wants something specific. I’m highly entertained. That is awesome! 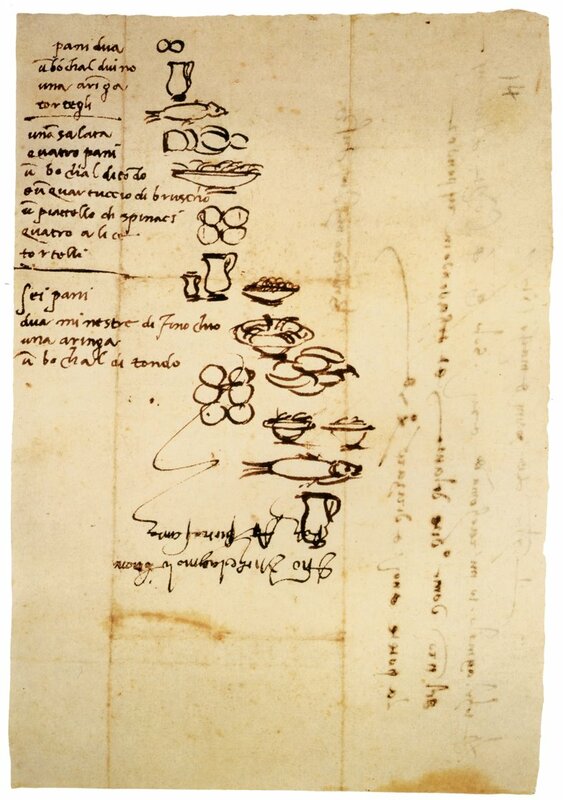 Even the images he scribbled down to describe what he wanted from the market look better than most people’s drawings. What a extraordinary look at the ordinary! Karl Pilkington taught me this years ago! I find it most beautiful and kind. A true master. I will try to have a copy of it in my kitchen wall. What a great human being he was. PhD.We are very different indeed. I am forever making do. I read Rabbit, Run. Had Updike evinced such concern for detail in his own work, I wouldn’t have had to plod uphill through page after tedious page. what a waste of time? not if that’s what he wanted to do… what are you doing right now, hanging out on Facebook and criticizing a great man’s use of his time 400 years ago? do you see the irony here? moron. “[Jeeves] eats tons of fish and moves in mysterious ways” as Bertie Wooster used to say. Charming diagram. Srsly? Those doodles would not have helped his servant figure out a herring, tortelli, two fennel soups, four anchovies and ‘a small quarter of a rough wine’. They’re just doodles people. Time to illustrate a shopping list but no time to take a bath. Seriously?? Someone actually finds a treasure like this and people are critiquing it and criticizing his purpose for doing so? Get real people!! This is a find……who cares why he did this, I’m just glad he did! Does anyone know where I can purchase a print of the grocery list?? Why do you think he wrote the list if it was for the illiterate servant? Did he make the list for himself first so he wouldn’t forget anything (or maybe he kept a running list, adding to it as he had need) then illustrate it? Also, what is that faded writing on the side? Even though he used iron gall ink, I doubt it’s fading. More than likely it’s the real message. Written in invisible ink. Age seems make it more visible. It’s ledgibile on the 5ft by 7ft CANVAS, OIL painting I’m studying. Ancient Italian, Michelangelo’s real bio, covers the back forming a Giant MB. His signature, first and last name and it’s dated. Photos to verify this, all true, but I doubt this will be printed because some group does not want the truth exposed. It’s interesting that this has been interpreted to be a shopping list. I thought , when I first saw it , that it was a list of the items he was going to put on the table for the Last Supper that he painted, as some things were in bowls,; but yes I see now it’s probably a shopping list. But then Debbie’s theory that it was really masking a message is intriguing and believable too, for those were difficult times. This is something I’ve tried to share for years with employees and mentees: how you do anything is how you do everything. That may or may not be a direct quote from Michelangelo…but I remember years back learning it as such and believing it. In fact, my current company CubicZirconia.com has two maxims: 1) better every day, 2) how you do anything is how you do everything. What a great way to exemplify such a core concept, thanks “Mic”!